Ice Wizard is one of the first Legendary Cards and hands down one of the best cards in Clash Royale. We can see him almost everywhere above Arena 5. People love using him because of not only his special slow ability but also his awesome appearance. Let’s take about the chill caster today! You can unlock the Ice Wizard from Arena 5. His special ability slows down the enemy movement speed and attack speed by 35%. This slow effect doesn’t stack. He is pretty cool. LOL. I was extremely lucky enough to get the Ice Wizard on the day it was released so I have had a decent amount of time to find the best uses for him! The Ice Wizard is primarily defensive troop. I have broken down the best ways to use him on defense below. I am also going to show you how to use him situationally, instead of against some specific decks before the meta always shifts pretty fast. Large pushes usually use a tank such as Golem, Giant or Royal Giant in front of supports to soak damage, protecting the support troops behind. While dealing with this deck archetype, separating the supports and the tank is extremely important! I will use the Giant + Musketeer + Minions push for example. While dealing with this push, I usually use the Inferno Tower to separate Giant and Musketeer, I also use Ice Wizard to distract the Minions from my placed Inferno Tower. Then, I use the Ice Spirit to stop the Musketeer from damaging the Inferno Tower. While dealing with Golem Witch beatdown deck, I usually use only Ice Wizard and Inferno Tower to shut down this push entirely. First, I use the Inferno Tower to pull the Golem to the opposite lane, allowing me to deal with the Minion Horde a lot easier! Then, I use the Ice Wizard and Zap to take out Minion Horde. After taking out the horde, Witch shouldn’t be a big deal at all. 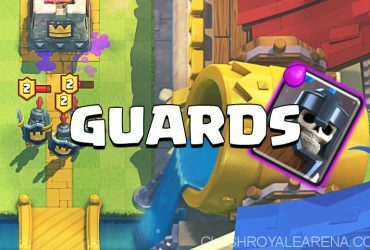 When defending against small pushes, the opponents usually use fast paced cards like Mini P.E.K.K.A, Hog Rider or Lumberjack. Using Ice wizard can be super useful to slow the entire push, making it a lot easier to counter. Although it may be a negative Elixir trade when using the Ice Wizard + a defensive building/troop to deal with a small push, you can use them all for the counterpush afterward! Yea this is probably one of the most popular pushes in Clash Royale. Hog Rider pushes are usually pretty cheap, which can catch you off guard. 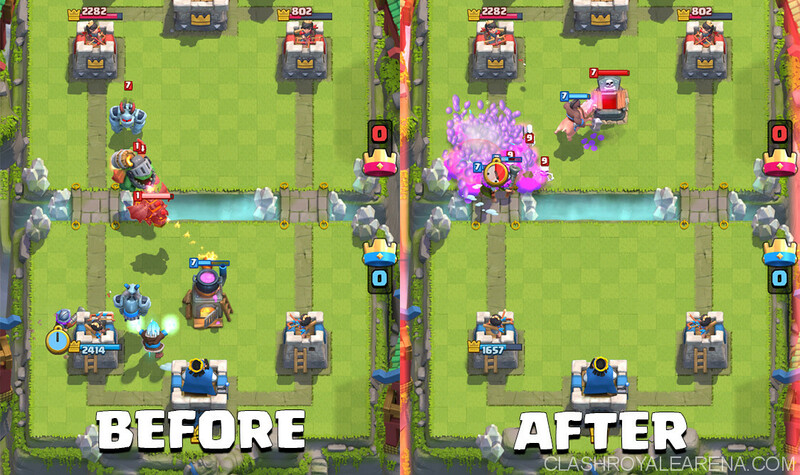 Using Ice Wizard can slow down Hog pushes and stop the supports from dealing tons of damage to your building. I also use Inferno Tower to directly counter the Hog and distract the low damage Archers behind. After taking out the Mega Minion, Ice Wizard starts hitting the Archers, allowing me to make a great counterpush with the survived Ice Wizard. Dealing with small and fast attacks can be very hard sometimes because you don’t know what you should play for a while. Using the Ice Wizard in those situations can slow them down a bit, giving you more time to defend better. For example, my opponent places the Miner to protect the Minion Horde coming towards my Tower. I use Ice Wizard + Zap to distract and then kill the Minion Horde. Then, I use the Lumberjack to take the Miner out. This would be a bit expensive but it allows me to build up a big counterpush which could take out the opponent’s Tower entirely. Please note that these are just plain examples of some familiar situations and how to use the Ice Wizard in those. You can use these strategies to deal with all deck archetypes. Because of the Ice Wizard’s cheap cost and his special ability, he can be great at distracting the opposing troops from dealing damage. He is also very useful even when you have expensive cards in your hands or no cheap defensive card. Using him to pull opponent’s troops to the kill zone, where both of your Towers can lock on to them can be very useful. I am going to show you how to pull units with the Ice Wizard. All of the cards above should be pulled by your Ice Wizard. However If you are in a bad situation, using him to pull other units would still work! Just wouldn’t be effective as the ones above. 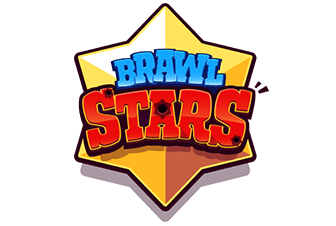 To counterpush with him, place him anywhere behind or next to your Tower, as long as he is able to hit the opponent’s troops. Place other medium cost troops down, which has good attacking capabilities. After defending successfully, make sure you have enough troops on the field to perform the counterpush. Place your tank or win condition in front of the survived troops. Please note that you shouldn’t use this technique as a win condition in your deck since not every deck has Fireball. The Ice Wizard can be so good at baiting out your opponent’s Fireball. However, I strongly believe that it is not that good at baiting out other spells because it’s not valuable enough for expensive spells and other spell spells can’t take him out! If your opponent has Fireball and you have Barbarians, Minion Horde and Ice Wizard in your deck, it is very effective to bait out his Fireball. Make sure that your opponent has the Fireball in his hand! Place your Ice Wizard behind your King’s Tower on the side of your more weakened Tower. He will most likely Fireball your Ice Wizard and the weakened Tower. You are now free to aggressively use your Minion Horde and Barbarians on offense. However, If he doesn’t use the Fireball, don’t try to do this again, your opponent is a smartass. Unfortunately, this is the only way you can use the Ice Wizard to bait out spell, I believe. It is fairly easy to counter the Ice Wizard, unless he is protected by other troop. Truly he is not the type of unit you want to protect because he is literally a support card and does a little damage. Anyway If you want to protect the Ice Wizard, place him in a hard to reach position, fairly far behind your tank/Tower. 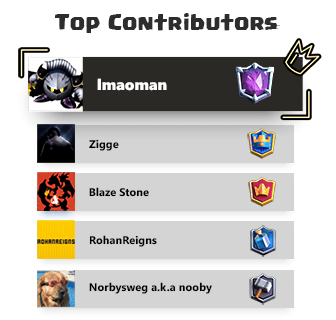 Knight and Mega Minion should be the best counters because they cost only 3 Elixir. 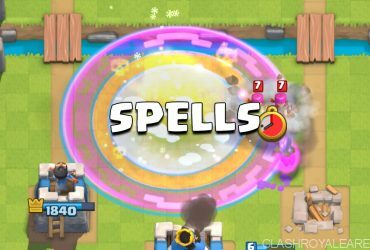 The second best counters to the Ice Wizard should be Mini P.E.K.K.A, Valkyrie and Lumberjack. Although they cost 1 more Elixir but they are the better options for counterpush. Swarm units, high cost cards and buildings are really bard at countering the Ice Wizard! 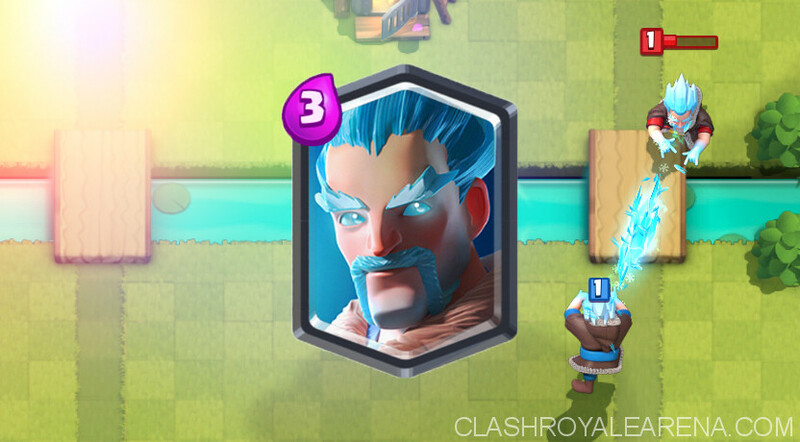 Because the Ice Wizard is one of the most versatile troops in Clash Royale, he fits into nearly any deck due to his useful ability. Below are some popular decks which utilize the Ice Wizard a lot! Hog Cycle Decks: This kind of deck usually focuses on getting the Hog Rider to the opponent’s Tower to do chip damage. Cheap supports are used to get positive Elixir trades and to cycle through the deck quickly. It relies on the Ice Wizard a lot to shutdown opponent’s pushes. Giant Beatdown Decks: This kind of deck uses the Ice Wizard along with other defensively capable and offensive units such as Witch, Musketeers, Wizard… to play defense. After defending, use Giant and survived troops to do the counterpush. Bait Decks: This deck archetype usually tries to out-cycle out bait out opponent’s spells so that you can punish them with high DPS swarms. The Ice Wizard is usually used in these decks as the sole defensive unit (instead of a defensive building).